Zuni is the name of both a people and a pueblo. The people's original name was A'shiwi, meaning "the flesh." The Zuni currently occupy Zuni Pueblo on the Zuni reservation in western New Mexico, a site that was formerly known as Halona, or "the Middle Place." Being one of the first pueblos contacted by Spanish explorers, the history between the Zuni and European colonists is long and fraught with violence, yet the Zuni have maintained many significant components of their way of life, including their language and their spiritual practices. 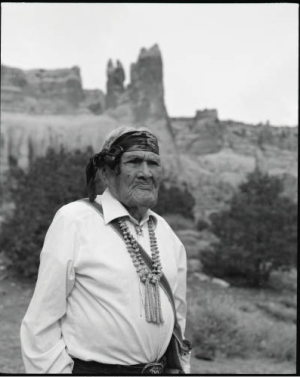 The Zuni are known for their unique farming methods and skills, their silversmithing, and their traditional ceremonies, especially the winter solstice Shalako celebration. "Mikalita Wasalute, Zuni Pueblo, NM, March 1992. Corn Mountain can be seen in the background," photograph, Lee Marmon Pictorial Collection (2000-017-B14-F50-1). Center for Southwest Research, University Libraries, University of New Mexico. 1935 Zuni Mythology. New York: Columbia University Press. 1992 Zuni Ceremonialism. Albuquerque: University of New Mexico Press. 1970 The Zuni Indians. Glorieta: Rio Grande Press.